Jazz Music History – Jazz is a type of music that grows from blues, ragtime, and European music mix, playing band music. Jazz is the music that originated in the United States in the early, 20th century with the roots of African and European music. This genre mostly uses instrument guitar, trombone, piano, trumpet, and saxophone. One of the most important elements in jazz is syncopation. The musician usually express their feelings that are not easily explained, because this music must be felt in the heart. Jazz was once associated with brothels and women with poor reputations. In its journey then, jazz eventually became a form of musical art. In certain compositions and improvisations, which reflected the melodies spontaneously. The jazz music history legend began in New Orléans and flourished into Chicago. And influenced by the music in New Orléans, tribal drums of Africa and the structure of European music. 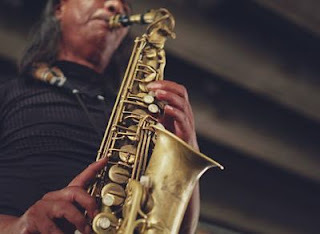 The background of jazz is inseparable from the fact that jazz influenced by various music, such as spiritual music, cakewalk, ragtime and blues. In jazz music history, one jazz legend that believed around 1891, the owner of a hairstyle in New Orléans called Buddy Bolden blew his cornet and it was jazz that began as a new discovery in the music world. Half a century later, jazz music in America contributed a lot to the music world, learning at the university, and eventually became a serious and calculated musical flow. As a popular art, jazz began to spread to people around the 1920s (jazz age). 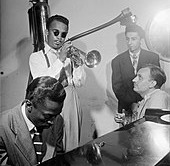 Jazz was rife in the swing era in the late 1930s, and reached its peak in the late 1950s as a modern jazz. When playing blues music, the expression that is radiated is also the same as the jazz style. The ability to play blues music is standard for all jazz musicians, especially for use in improvisation and jam-sessions. The blues music itself, originating in the South, has a very wide history. Blues musicians usually use guitars, pianos, harmonica, or play together in groups that play musical instruments homemade. Jazz music history, divided into several phases / eras. From the Dixieland and Ragtime stages at the beginning, the era of swing and big band (1930-1940), bebop era (mid 1940), jazz latin (1950-1960s), jazz rock or fusion (1970s) and recent developments that brought the phases and new era such as acid jazz, jazz funk, cross music and so on. Ragtime is unique because it doesn’t include improvisation and blues. This became the influence of the jazz origin form, lasting for about the first 15 years in the 20th century. Generally a music for piano that has been written as a whole can be displayed by the orchestra and represents a mixture of classical influences and marching bands. Try listening to music from Scott Joplin to taste ragtime. Dixieland is a style that regarded as a variant of jazz classics and jazz of New Orléans. The original roots of dixieland as a musical form sourced from the Chicago music scene in the 1920s. Unlike other jazz styles, dixieland musicians is somewhat limited, but offers endless variations in the sound model, developed around the 1910s. Along with the development of ragtime, New Orléans jazz appeared in the jazz scene for the first two decades of the 20th century. Jazz music history. New Orléans jazz has become unfit for marching brass bands. There was documentation of the first New Orléans jazz, from The Original Dixieland Jazz Band in 1917 to the 1920s. When the recording technology had evolved. This growing music includes trumpet players and cornets, such as Joe Oliver and Louis Armstrong. Shown as an ensemble-oriented style, with trumpet players playing melodies, harmonies and counter melodies coming from trombone and / or clarinet players. The rhythm section develops into a banjo ensemble, drum, tuba or bass, and piano. Overall, an important point in New Orléans jazz is to emphasize an ensemble and not a solo. This music continued to spread its wings during the 1920s.Began rivaled by the birth of swing music that will eventually replace this type of music. Dixieland style, which grows in tandem, maintains the basic structure of New Orléans jazz. Next on jazz music history. Duke Ellington Big Band Around the 1920s and early 1930s, the Filip dance was a very popular dance at the time. The melody that accompanies the dance is soft and romantic, usually accompanied by an orchestra. The orchestra plays in accordance with what is written on a piece of paper and the singer must sing very softly and slowly (usually the singer uses a tenor vote). In the 1930s was the birth of swing music. This new effect is better than in the 1920s, but when asked about the music, certainly makes everyone seemed to want to dance swing. Most of the jazz bands adopted this style in the early 1930s, but the band that played “sweet” remained the most popular band among white dancers until someone named Benny Goodman appeared in Palomar Ballroom in August 1955 with his more “hot”. The audiences of young white dancers love the “hot” rhythm of Goodman and the composition of his swing music. Hot swing and Boogie Woogie became the dominant form of American music for the next ten years. Then many popping up after this swing became popular. Bing Crosby and Frank Sinatra wear swing bands to give a very good effect in their music and still keep this into popular music, even though the rock n roll era has arrived. Miles Davis Bebop is one of the streams of jazz music that has a unique characteristic. Very fast tempo by prioritizing improvisation on the structure of harmony and not improvisation on the melody. Bebop music was developed in the mid 1940s and began to play famous musicians in the first 2 years of World War II. In the era of the 1940s, jazz fans began to leave the swing music of the 30s. The top musicians such as Dizzy Gillespie, were very inspired by the previous generation. Such as Art Tatum, Ear hines, Coleman Hawkins, Lester Young, and Roy Eldridge. Bebop describes the drastic change of the swing jazz era. With the character already described above, fast tempo, asymmetric phrases, melodies filled with intrigue and rhythms that really changed drastically. Bebop often appears as a nervous and often disconnected and divided music. But for almost all jazz musicians, the bebop music era recognized as the most beautiful jazz music history revolution. The freedom offered by bebop music, in the structure of the music really opposes the musical swing more towards musical arrangements for the orchestra or band. In bebop music, you will find a lot of personal improvisation in chord and musical instruments. Even when jazz musicians have their music playing, jazz bebop will give you a spontaneous improvisation where even musicians won’t able to repeat their improvisation from beginning to end. Here is the biggest difference from bebop music when compared to music swing. The addition of the complexity of the melody is also a new trend in the bebop era of jazz. In most jazz bebop, there are several commonly used instruments. The instruments are saxophone, trumpet, drum, bass, and piano. The first format of jazz bebop was popularized by duet Charlie Parker and Dizzy Gillespie in the 1940s. Charlie Parker and Dizzy Gillespie also often adds saxophone, guitar, trombone, or violin in their jazz bebop composition. Although only one of the streams of jazz music, until now bebop is still played around the world. Characteristic of a very complex harmony substitution and a very free improvisation becomes the joy of many jazz musicians. In all jazz education, the flow of jazz bebop is an alternative to express themselves. Bebop music is best played in small-group formats, quartets and quintets proves ideal for economical and artistic reasons. This music developed in the neighborhood of urban jazz clubs. Briefly, bebop musicians make jazz an art form that is not only intended for taste, but also intellectual intelligence. It stars to emerge in the bebop era, among them is Trumpeters Clifford Brown, Freddie Hubbard and Miles Davis, saxophonists Dexter Gordon, Art Pepper, Johnny Griffin, Pepper Adams, Sonny Stitt and John Coltrane, and trombonist J.J. Johnson. In the 1950s and 1960s, bebop experienced several mutations: hard-bop, West Coast, cool-jazz and soul jazz among them.